Before he left for Vietnam in 1968, Marine Corps F-4B Phantom fighter-bomber pilot Captain John A. Lavoo told his mother, "If I don't come back, you'll know where I am." He didn't come back. And it took more than 31 years locate, repatriate, identify and return his remains and those of his friend and navigator-bombardier, Marine Captain Robert A. Holt, to their families for burial. 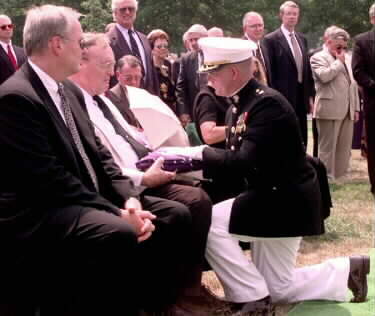 "I feel so relieved to know that he definitely has been found," Konstance Lavoo said after the July 19, 1999 military memorial ceremony at Arlington National Cemetery. "I'm grateful. I felt in my heart that he was safe with God. I didn't feel he was in any pain or agony. And I always felt like I knew where he was." POW/Missing Personnel Office spokesman Larry Greer said Lavoo and Holt crashed on September 19, 1968, after launching rockets against a target in Quang Binh, North Vietnam. A large explosion reportedly erupted when the jet crashed. According to incident reports, the wingman saw no parachutes, heard no beepers and, along with a tactical control aircraft, made low passes over the wreckage and saw no sign of survivors. An electronic sensor search was fruitless; the enemy presence prevented ground search and rescue efforts. Human remains and crew-related artifacts were uncovered at the suspected crash area after two years of research and nine months of excavation by U.S. and Vietnamese investigators. 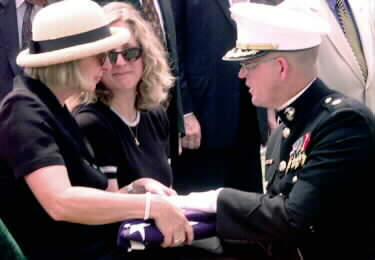 They were repatriated in September 1994. The Army Central Identification Laboratory in Honolulu in April positively identified some remains as Holt's and others as Lavoo's and returned them to the families for burial. There were remains so badly damaged, however, that lab scientists couldn't assign them to either man. In an unusual twist, the remains of each men were buried in two places. Lavoo's identifiable remains were buried in one Arlington grave. To his side in another grave, the unidentifiable remains from the crash site were buried under a marker with both men's names. One of Lavoo's 1962 Naval Academy classmates, Rev. William M. Krulak of St. David's Episcopal Church in Baltimore, delivered the eulogy at the Arlington memorial service. A retired Marine Corps Reserve colonel, the minister is the older brother of former Marine Corps commandant Gen. Charles C. Krulak. "This was a very bittersweet day," Krulak said after the ceremony. "The families have gone on with their lives. They had already said their goodbyes, and yet here's a chance to bring John Lavoo and Bob Holt back to their home and the country they fought and died for, and put them to rest here in this very sacred place." 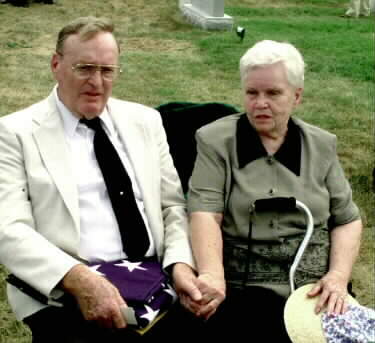 Clifford Holt, 83, buried his son's identifiable remains in Reading, Massachusetts, about 15 miles north of Boston. "I felt [they] belonged with his mother, who passed away more than 20 years ago," he said. The elder Holt, of North Port, Florida, attended the Arlington ceremony. He said he was shocked when he received news that his son's remains had been identified. "It brought a partial closure," he said, noting that, from the crash reports, he knew his son hadn't survived. "We didn't think it was practical that he survived, so we had to face reality and live with that." Lavoo's daughter, Karna, was 2 when he died. She said she was going into labor earlier this year when told her father's remains had been identified. "It was kind of a shock because analysis of the remains had been going on a few years," the Marshfield, Wis., resident said. "I felt more sadness, because even though I don't know him, I'd always heard about him being a great man. It's hard to think about the potential he never had a chance to pursue." Konstance Lavoo and Clifford Holt hold hands to comfort each other following funeral services for their sons at Arlington (Va.) National Cemetery. MarineCaptains John A. Lavoo and Robert A. Holt died in Vietnam in 1968; their remains were repatriated in 1994 and identified in April. Photo by Rudi Williams. 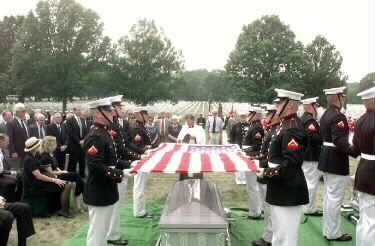 Marine Corps Major Mark Ward presents Clifford Holt the American flag draped over his son's casket during funeral services at Arlington National Cemetery. Marine Captains Robert A. Holt and John A. Lavoo died in Vietnam 31 years ago, and their remains were identified after five years of study. Richard Holt, left, watches the July 19 presentation. Photo by Rudi Williams.